Welcome to Heartcatchers, a strategic two-player decetpion game. Your goal is to catch as many hearts as you can - but watch out for the tricky effects of the Secrets! 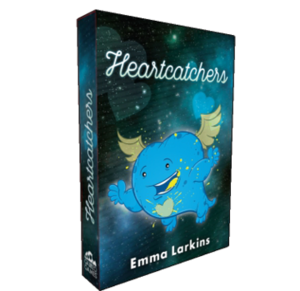 Heartcatchers is now available for purchase on the Galileo Games website! Players take turns "catching" stacks of cards, moving them back and forth across the playing field to increase their end scores. They can also play Secrets (or bluff the playing of Secrets) that affect scoring, or use card actions such as Heartbreaker or Your Eyes Only. This portable, fast-paced game (only 20 cards and playable in under 10 minutes) is a great way to break the ice with new friends and potential love interests. Official Boston FIG 2015 selection. Featured on Geek & Sundry and The Noobist. For more info, click here or check out the BoardGameGeek listing. Download the rules .pdf here. Huge thanks to all the people who made the Kickstarter a success!